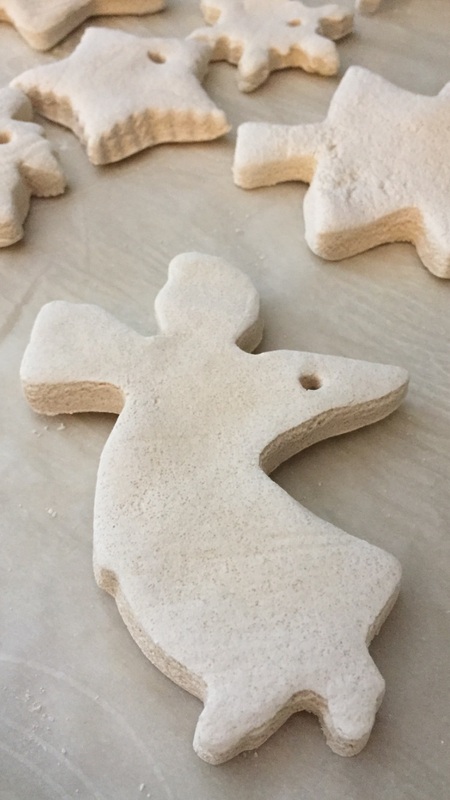 Usually we make cinnamon dough ornaments, but this year I decided to make salt dough ornaments for something different. I had read on a blog that if you mix white paint in with the dough they come out whiter. But I forgot them in the oven so they got a little brown, defeating the purpose. For my first ever Christmas Tree in my own apartment in 1986 I decorated it with cornstarch ornaments cut into stars and reindeer and hearts and cinnamon ornaments and bows. The memories of that tree! I loved it so much. It was so simple. Now my tree is decorated with a mixture of ornaments - many are handmade by my kids and me through the years. Every year we break a couple of the old ones, so we make new ones.